Soon, the testing and developing of class-leading strains will continue. For now, we can take a moment to reflect on this year's Highlife Cup awards and bask (if only for a minute) in the glory. Hard work, dedication, and loyal customers are integral to a successful business. With that being said, boy does it feel good when industry experts also recognise your products. This year, Royal Queen Seeds took the Highlife Cup by storm, winning first place in two separate categories! Both awards signify our team’s relentless approach to developing the best possible weed through careful, precise breeding and years of expert knowledge. Started back in 1994 by Highlife Magazine, The Highlife Cup is one of Holland's most prestigious award ceremonies, also carrying the accolade of being Europe's oldest cannabis cup. The Cup sets the standard for the best weed and hashish in Holland’s world-renowned coffeeshops. The judging process is more than a bunch of guys or gals sitting around a table smoking weed, though. Companies positioned in the cannabis market play no part in the judging process—the focus is solely on the quality of the weed produced. As a result, 15 judges are given coded samples to test over a period of two months. None of the judges know who produced which strain, and there are no restrictions on how they enjoy their cannabis. Each judge awards a score, which, when collated together, forms the overall score for each strain. The categories for the awards vary, but cover all aspects of cannabis—catering to every weed connoisseur’s needs. The road to success has been a hard-fought one, but this year is not the first time Royal Queen Seeds has been awarded at the Highlife Cup. 2013, 2014, and 2015 all saw RQS win several awards in multiple categories. Smashing the competition with “Overall Winner of The Highlife Cup 2013” is our Royal OG Kush Blend. Entering her as a hash concentrate variant, judges were particularly impressed by the smoothness and dominant THC content. The strain was also praised for catering to medical cannabis users. Shining Silver Haze was the award-winner at The Highlife Cup 2014. Beating out other competitors, it was awarded 1st place in the “Bio Haze” division. Incredible taste and a potent cerebral high proved to be a winning combination. The sun was shining on RQS in 2015 on Cannabis Liberation Day. A day packed with activities and celebrations also hosted The Highlife Cup. RQS entries would take home two awards that day. 1st place with Euphoria in the “Medical” category and 3rd place with Medical Mass in the same division. If we are honest, we pretty much dominated the medical marijuana selection that year. Both strains boasted high levels of CBD, providing a balanced high that kept users active throughout the day. Fast forward to this year, and RQS is proud to say we have received another stellar selection of awards. Selling seeds is one thing, but having a genuine passion for crafting our own excellent products underpins the entire business. The competition was fierce, and all companies submitted class-leading strains. Without further ado, here are this year's Highlife Cup Winners from Royal Queen Seeds. Featuring an even split of indica and sativa, Royal Gorilla achieves the best of both worlds. A smooth blend of earthy-sweet flavours complement the lemon and pine notes. Already aware that this strain hits like a train, medical users can take solace in the fact that our soothing silverback will quell their aches and pains. 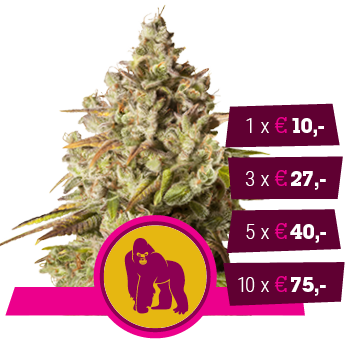 Royal Gorilla is no slouch in the growing department either; respectable yields of 500–550g/m² can be achieved when grown indoors, with 600g/plant when cultivated outdoors. Royal Gorilla has firmly cemented its place as the go-to strain for medicinal marijuana users, or just those who want to experience her divine taste and couchlock-inducing high. A force to be reckoned with, Royal Cookies leads the charge for indica strains, taking 1st place. Indica strains are known for producing massive central colas and providing an enveloping high that soothes the body. Royal Cookies is no exception to that rule; instead, she takes all the critical attributes of an indica and wears them with pride. Deep relaxation and waves of euphoria await those prepared to take her on. Not that smoking her is a challenge, but with 23% THC, novices are advised to pace themselves. Royal Cookies’ sweet and earthy flavours may be enticing, but soon, your body will start to succumb to the superior high provided by this indica-dominant strain. Producing top-quality attributes in every respect, growing is also a delight. Heights are typical of an indica, reaching anywhere between 80–110cm when grown indoors. Yields impress at 450–525 g/m², with her majesty ready after only 8–9 weeks of flowering. Given her abilities, it seems obvious why Royal Cookies was best in class among indica strains. Regardless of your strain preference, Royal Cookies proves you can be an award-winning all-around performer.